Tomorrow is the last day of school. I have a bunch of plans to be the fun mom who does all the things. We’ll see how that goes. Things like science experiments, art projects, children’s museum visits, play dates, dumping them at the grandparents. Ooops, I let that last one slip. 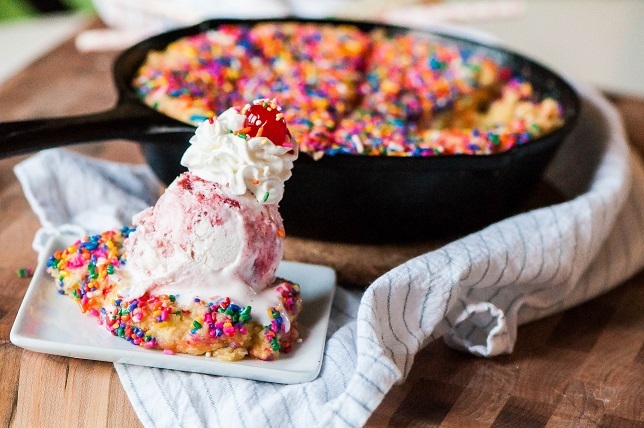 Baking cookies is definitely on the list too and this giant Funfetti Cake Batter Skillet cookie is right at the top. I made it this week to celebrate the last week of school and to drown my sorrows. 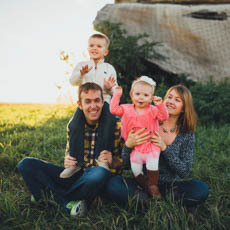 I love my kids, I really do. They just argue and fight ALL.THE.TIME. and my quiet, introverted self just can’t take it sometimes. But cookies definitely make it better. Especially when they are thick and gooey and ridiculously coated in sprinkles. And topped with strawberry ice cream and whipped cream. Plus, this giant cookie tastes like cake batter. The end. Ok, so I guess I’ll tell you more about it but at the end of the day, that’s kind of the selling point right? Sugar cookies are my favorite kind of cookie and naturally adding cake batter flavors make them tastier. Is tastier even a word? Butter extract and almond extract are used, along with a bucket of sprinkles and vanilla pudding mix to make a super moist batter that tastes crazy close to cake batter. Then smoosh the whole batch into a 6 inch cast iron skillet and top with a layer, yes a layer, of sprinkles and bake that bad boy. If you want a thinner skillet cookie I don’t understand you and we can’t be friends use a bigger cast iron skillet or scale down the recipe. The first time I tested this recipe, I made them as regular size cookies to take to Noah’s school for teacher appreciation day and they were delicious this way too (I’ll include directions in the notes section of the recipe for this option). So what I’m saying is no matter the presentation, they are going to be dang good. So just make them, ok?So what I’m saying is no matter the presentation, they are going to be dang good. So just make them, ok? In a stand mixer, cream together the butter and sugar. Add egg and mix until incorporated. Add butter extract and almond extract, mixing again. In a bowl, combine the flour, baking powder and salt. Add to creamed mixture and mix until just combined. Stir in 1/3 cup sprinkles. Spread cookie dough into a 6 inch skillet and smooth the top. Sprinkle with the remaining 1/3 cup sprinkles. Bake for 35 to 40 minutes, until lightly golden and barely set in the middle. For individual cookies, mix as above. Instead of topping with sprinkles, roll cookie dough balls in sprinkles and place on parchment lined cookie sheets. Bake for 9 to 11 minutes.